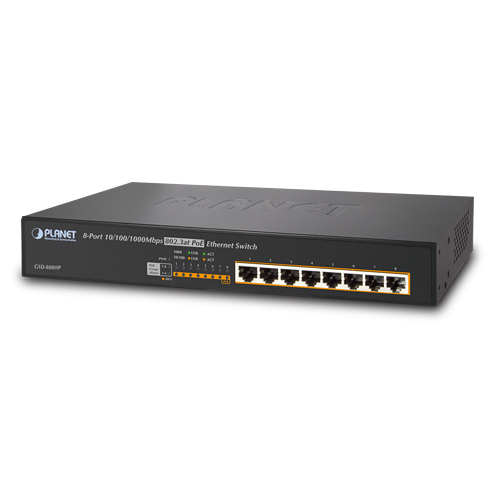 Having the capability of IEEE 802.3at Power over Ethernet standard, the GSD-808HP can directly connect with any IEEE 802.3at end-nodes like PTZ (Pan, Tilt & Zoom) network cameras, PTZ Speed Dome cameras, color touch- screen Voice over IP (VoIP) telephones, and multi-channel wireless LAN access points. Besides the wired Internet network, the wireless LAN would be more efficient for the transportation station to provide high-speed and wide area Internet services for travelers. By adopting PoE Wireless LAN structure, the transportation authority gains benefits from less cost while providing better Internet services in wider areas for the travelers. With the business office expansion, the additional telephones required can be installed at less cost via the implementation of PoE IP Telephony system than that of the traditional circuit wiring telephony system. 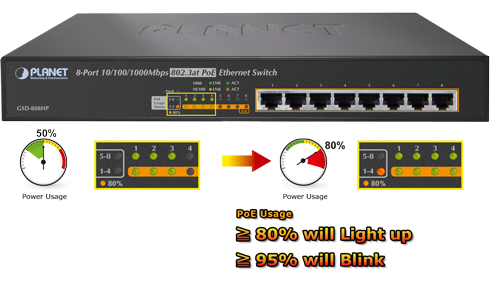 PLANET GSD-808HP 802.3at Desktop PoE Switch helps enterprises to create an integrated data, voice, and powered network. PLANET 802.3af compliant IP Phones can be installed without additional power cable because the power can be provided via the standard Ethernet cable from the connected GSD-808HP. PoE IP Phones and Analog Telephony Adapter work perfectly with the GSD-808HP which injects power through the Ethernet cables. With the GSD-808HP, IP Telephony deployment becomes more reliable and cost effective, which helps enterprises save tremendous cost when upgrading from the traditional telephony system to IP Telephony communications infrastructure. 2013-07-05 3.0 Release for hardware version 3.0 and 4.0.